Never forget your PIN again with PIN-less entry. Enter your conference calls instantly and forget your PIN forever! Register your phone number with FreeConference.com and you’ll never have to remember your PIN again. 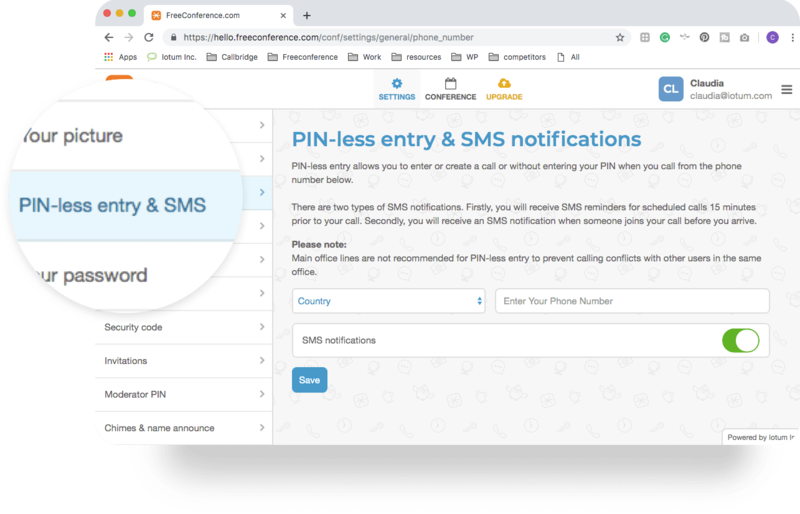 Our system will recognize you based on your phone number and automatically connect you to the right conference call without having to enter your Moderator PIN or Access Code. PIN-less entry works for any scheduled conference call you organize, or are invited to by another organizer. No PIN, no problem! Just dial-in and connect. Please note: Main office lines are not recommended for PIN-less entry to prevent calling conflicts with other users in the same office. If you choose to register a mobile number you may also receive SMS notifications.